Proud to be tasting and selling tea from 30 tea farms from India, Indonesia, Taiwan, Korea, and all over Japan. View an exhibition of photos of tea producing areas including an exhibit of local costume. Let’s warm Tohoku (Northern Japan) with Tea this winter. In the first 2 weeks of January, 2012, the farmers of ITFA member Kyoto Obubu Tea Plantations will be driving around North-Eastern Japan (Tohoku) to warm the people of Tohoku in the cold days of mid-winter with our tea and your warmth. The region is, of course, where the devastating earthquake and tsunami struck in March 2011, and Obubu hopes that their cup of tea will lend a bit of relief to those facing such hardships this winter. Supporting Obubu are ITFA members Kinezukas, Ukibe Seicha, Taiwan’s Dignitea, and others. Our overseas business partner, Matcha Latte Media, is volunteering to translate your messages and print them on New Years greeting cards to give away at some of the events (depends on how many messages we get). Submit your own message here. International Tea Farms Alliance (www.teafarms.org, Director: Yasuharu Matsumoto) and Obubu Tea Plantations (President: Akihiro Kita) will be touring areas affected by the March 2011 earthquake. In the first two weeks of January, 2011 we’ll be travelling from the northern part of Iwate Prefecture to the Kanto Region. We are planning to visit places such as temporary shelters, senior citizens home and many others for this project. Our project aims to warm the hearts of people in Tohoku in the cold mid-winter months with our tea and to gather together people in Japan and overseas with the same aim to share your warmth with them. It will be something delightful for the communities there who are living in temporary shelters and who have just moved from evacuation areas. This project is being supported by donated funds collected earlier this year, Obubu’s revenue, and by funds from the ITFA. We will be traveling south from Tohoku – starting from Tanohata, Iwate prefecture to Tokyo. We will make stops and move by cars. We are still finalizing the details. However, we are still lacking the support and materials such as volunteers, information locations in Tohoku, money and we are still working on our schedule. In other words, everything is still an ongoing process for us. Some of you might ask, “What are we going to do? !” – Our answer is “TEA”. We believe that as long as we have determination, We Can Do This! Let’s do this together!!! Further details are still available only in Japanese. The first shipment of GTT Club was from Japan. Five types of tea were sent to the members around the world from four farms in Japan. We are very happy to accept much review in favor. If you are not registered to GTT Club yet, join our club and enjoy tea around the world. Tea farmers in Japan, specifically Shizuoka, Kanagawa, Saitama, and the prefectures directly surrounding Fukushima where the nuclear power plant is located, have had their tea shipments stopped due to radiation contamination. Founder Matsumoto Yasuharu will be speaking about the establishment and debut of this new non-profit organization amid the global focus on radiation contamination of tea leaves in Japan after the Tohoku Earthquake. Tea farmers from Minami Ashigara, one of the first regions discovered to have radiation contamination above government standards, will also be present to discuss their experience. The ITFA will also be serving tea from tea farms of various regions in Kyoto, Shizuoka, and Fukuoka as well as Taiwan via their Japan distributor. We are very grateful to have had 15 people attend on location and 10 people via web streaming including several journalists. Thank you very much for listening to our explanations of the current situation regarding tea and efforts to reduce contamination levels. Much thanks also to the restaurant, Yasai Kichi, for providing the venue free of charge. Photos in this gallery were taken when visiting tea farmer Minako Uehara and Japan Agriculture officials in Minami Ashigara, where the very first tea shipments were ordered stopped due to radiation contamination. At the even Ms. Uehara spoke about her experience when the tea was first discovered to be radioactive. Director of the Kanagawa Prefectural JA Tea Center, Tetsuya Ishiwata, spoke about the efforts that government and research facilities have made to understand how the tea leaves were contaminated. The result of the research: tea leaves absorbed radioactive particles through the photosynthesis process in the leaves, not through roots in the soil. This means that the plants can be cleaned of radioactivity via cutting and disposal of the leaves. Video greetings are coming soon! HISTORY: Tea has been found in historical records dating as early as 815 AD (Nihon Kouki 『日本後記』), and was a rare luxury available only to high ranking monks and aristocracy. It wasn’t until Zen Buddhist monk Myōan Eisai (明菴栄西) returned from China with tea plant seeds and cultivation techniques learned from his Zen studies that the plant began to be grown in Japan. The form of tea he adopted from Chinese Zen monks is what now is known as the powdered tea matcha, and is the reason why this drinking form of tea developed into the Zen-influenced Japanese tea ceremony over the centuries. Between the 14th and 17th centuries, producers started steep leaves that had not been made into matcha. This became known as sencha or 煎茶 (the character 煎 also means to brew or steep). In 1738, Nagatani Souen (a tea farmer in Ujitawara, Kyoto) developed a method to dry tea leaves fast in a hoiro or a warmed table. This was the birth of modern-day Japanese sencha. But the development of Japanese tea did not stop there. In 1835, the 6th Yamamoto Kahei (of Yamamotoyama) invented gyokuro tea, by using shading techniques to cultivate leaves rich in umami flavor (now known to be L-theanine amino acids). In the last hundred years, Japanese farmers and tea manufacturers have continued to innovate, inventing genmaicha – or green tea flavored with toasted rice, houjicha – roasted green tea, and creating hundreds of cultivars that produce different flavor characteristics for different types of Japanese tea. Return to top | Have something to add to the above? Leave a comment! Having established his farm in 1976, Toshiaki Kinezuka has spent the last 36 years growing tea leaves organically, long before the trend word “organic” found its way into supermarkets around the world. His daughter Ayumi is fluent in English and has given a great interview at samovarlife.com/08-ayumi-kinezuka-presents-her-fresh-crop-tea-1. TEA: Yabukita Midori – Soil development of a tea field is a decade-long process and Kinezuka-san has had many years to perfect his cultivation methods. The result of that is the Yabukita Midori tea leaf, made from the Yabukita tea plant cultivar and harvested in the week of the 88th day. In Japanese tea culture, the 88th day after the start of spring in the old calendar is when the tea leaves are said to be at their best, and tea made from these leaves is said to grant you long life. The taste is a deep balance of sweetness and astringency. Yame tea is a very special tea that can only be harvested in a very limited area of the southern Fukuoka mountain region. Tradition has it that eight women in the Hoshino and Yabe Village town Zyouyou Kurogi stayed in the mountains where they carefully began processing this special tea. This is known as the “princess tea story” and is the foundation of the The Kurihara Family Tea Farm. In its third generation, Kurihara Seicha continues to provide high quality teas with a specialty in the delicate process of gyokuro. Visit our website for more information about our product offerings and learn about our unique story. Kurihara is now in the trusted hands of a knowledgeable management team that is committed to producing safe and delicious teas for their customers. TEA: Old Style Gyokuro – Translated literally as “traditional pure dew drops”, this tea is made with the traditional methods passed down through hundreds of years of Yabe Village tea farmers. Gyokuro tea is known throughout Japan for the syrupy, sweet-savory flavor that comes about by shading the tea leaves for 3-4 weeks before harvest among other unique cultivation and soil management techniques refined over the centuries. “Old Style Gyokuro” utilizes among other things natural shading material such as straw or bamboo; when it rains, the droplets of water infused with the flavor of the shading material fall down onto the leaves and flavor them—hence the name gyokuro or “dew drops”. Over 15 years ago, our president and founder, Akihiro “Akky” Kita, visited Wazuka, Kyoto. The tea produced in this rural district is known as the best sencha growing areas for the Uji region, the birthplace of Japanese tea. Akky was a college student in search of his life’s calling, and inspired by a single cup of Ujicha drunk at its source, his passion for tea farming was born. After years of learning to master the art of growing premium tea leaves from master tea farmers in Wazuka, Kyoto Obubu Tea Plantations was born. The name Obubu itself comes from the slang of Kyoto and means tea (in standard Japanese, it would be ocha). TEA: Houjicha & Genmaicha – The roasted green tea, or houjicha, produced by farmer & president Akihiro “Akky” Kita at Obubu is harvested in June. Akky uses a small tea leaf roaster to get just the right balance of temperature and humidity for this tea. The process also decaffeinates the tea producing leaves that have almost no caffeine and one that is said to be very effective at warming your body. Akky recommends drinking this tea after dinner or before going to sleep. In the summer time, it makes a smooth, refreshing iced tea or cold-water steeped tea. Obubu’s Genmaicha, or brown rice tea, is made with new leaves harvested in the summer. Instead of regular rice, Obubu uses sweet rice grown locally in the valley of Wazuka, creating a tea with a strong, sweet, toasty flavor and an aroma that fills the room. Again, enjoy this tea in the summer as a delicious iced tea. Our award-winning tea possesses an elegant scent and mild taste. Grown in Chiran town, located just south of historic Kagoshima, our tea has a tradition of being one of Japan’s highest quality teas. Conducting our own soil research we are able to control the amount of fertilizers and other chemicals with which we have to treat our fields. This is our commitment to the customer to only providing the most safe and delicious tea. We take extra care during the processing of our teas to adjust to weather and other external conditions to ensure a well-balanced flavor. Our new mechanical process allows us to provide our same high quality tea to our customer at a fraction of the cost. Come out for a visit to our farm to see for yourself. TEA: Sencha Superior – Harvested in April, this sencha is made with new tea leaves when they are at their most tender. As a result these leaves create a tea with a beautifully clear but deeply green color. Even before you take your first sip you will feel your heart beating with anticipation. The taste is similar to deep steamed sencha, with a soft, round astringency and a characteristically deep aroma. 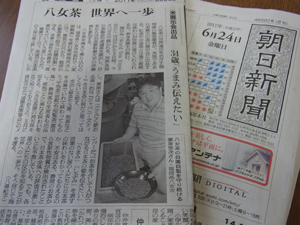 An article (“I want to introduce the taste of Japanese Tea at World Tea Expo”) about Kurihara-san of Kurihara Seicha was published by the Asahi Shimbun Newspaper on June 24, 2011. An ITFA tea farmer, Kurihara-san took part in the ITFA’s booth at the World Tea Expo in June. Kurihara-san and his family has been cultivating and processing tea since his grandfather started the farm. Based in the Yame region of Fukuoka Prefecture, Japan, Kurihara Seicha produces Yame-cha, one of the most famous regional teas in Japan. “I want to introduce the attraction of Japanese tea that connect people to people,” said Kurihara-san when asked why he took part in World Tea Expo. Find out more about the World Tea Expo here. August 5, 2011 — Kyoto, Japan — The International Tea Farms Alliance (ITFA), a new non-profit organization based in Kyoto Prefecture, Japan, is officially announcing today its Global Tea Tasters Club, a membership service in which members receive tea leaves directly from ITFA tea farmers in various regions six times per year. Members of the Global Tea Tasters Club (GTT Club) can join for a fee of 20,000 yen (approx. US$250) per year or 1,900 yen (approx. US$24) per month (payment for the first two months are lumped together for 3,800 yen). Every shipment will feature a minimum of 150 grams of tea leaves cultivated by farms from a specific geographic region beginning with Japanese farms in August, Taiwanese farms in October, and Indonesian farms in December. Correction: Originally, the above listed tea Indonesian farms in October and Taiwanese farms in December. Please accept our sincerest apologies for the mistake. In addition to the tea leaves, members of the club will receive information about the tea farmers themselves as well as about the tea that is included with each shipment. The ITFA will also be working with farmers to provide short video greetings on its website, www.teafarms.org, available only for GTT Club members. Those GTT Club members who are not already registered members on ITFA will be automatically registered to the website. The funds raised through this service will be utilized by the ITFA to both translate information about farmers (including farmer blogs) as well as educate farmers about consumers around the world. The aim of this effort is to bring tea lovers closer to the farmers by sending them samples of the tea leaves, and to bring farmers closer to tea lovers by providing market insight into consumer markets in different cultures and regions. www.teafarms.org/globalteatasters. Photographs and inquiries can be directed to the ITFA’s PR agent and consultant, Ian Chun, at ian@mlatte.com. The primary objective of the organization is to bring producers (tea farmers) and consumers (tea lovers) closer together utilizing web technologies as well as in-person events, trade shows, and conferences. By increasing awareness of each other, the ITFA seeks to simultaneously support consumers by increasing transparency in the tea industry and enhance the value for tea farmers and their tea products. The organization also seeks to raise interregional communication between tea farmers, and is planning a tea farmers conference in Kyoto, Japan, in March 2012. The ITFA believes that a lot can be learned by farmers as they share information about agricultural techniques as well as market knowledge, shipping logistics, regulations, etc. In addition, the ITFA hopes that the availability of farm information will aid both smaller tea retailers looking for a direct supply source as well as larger distributors by creating brand value for the tea leaves sold. Currently, the ITFA itself does not operate as a distribution cooperative other than the service provided by the Global Tea Tasters Club. For more information about the ITFA and ITFA farms, please visit www.teafarms.org. Photographs and inquiries can be directed to the ITFA’s PR agent and consultant, Ian Chun, at ian@mlatte.com. The ITFA would like to thank the following organizations for their help and advice over the past few months as we set up our non-profit organization and service: World Tea Media, International Tea Cuppers Club, Japan Brand Project at the Japanese Ministry of Economy, Industry and Trade, and countless volunteers. What if I register after the 2oth of a shipment month? Or on a non-shipment month such as September? While we do not require you to purchase one entire year of membership, our guarantee is for 6 tea leaf shipments in each full year of membership. Of course, we hope that our relationship will be a long and continuing one, and we hope that you will take an active part in helping the ITFA grow to help farmers and consumers around the world.